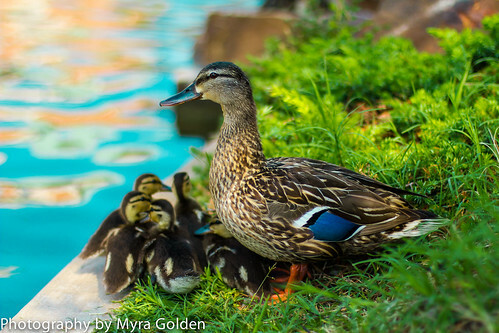 Mother Duck and Ducklings, a photo by Myra Golden on Flickr. Last Saturday my family and I enjoyed a fabulous lunch on the river and after lunch we strolled along the river and watched the ducks, geese, and boats. My mother joyfully motioned for me to look down under a shade tree. I looked and saw a mother duck and 5 ducklings. The ducklings were simply adorable! The mother duck watched carefully, yet not intensely, over her little ones. I was rather surprised to see a couple of the ducklings venture out and swim. They swam several yards away. They were so very tiny and I worried that they might swim too far and maybe get separated from their mother. The mother duck seemed confident that they’d be fine and she was unmoved by the fact that her tiny ducklings swam so far away. On and on the ducklings swam. Soon, the other ducklings ventured out too and in a different direction. Mother duck stayed put. Her ducklings were fine because ducks were born to swim and they knew how to find their way back to mama. As I watched the ducklings swim to the other side of the river and downstream, I thought about a manager and employees and empowerment. In order to thrive and to create the most value to companies and customers, employees need the freedom to venture out and “swim.” If you’ve hired the right-fit employees, it is their nature to take care of customers and to use good judgment when making decisions about how to resolve any issues customers encounter. Managers need to confidently let employees go and take care of customers, knowing that they will do right by customers and the company. And if they get into a pinch, employees know how to come and find you. Zappos has a Confident Mother Duck Mentality. Zappos employees are empowered to do what it takes to fix problems customers encounter. Employees are free to send customers flowers, chocolates, or a product replacement. Mother ducks at Zappos don’t shadow their ducklings. There is no set dollar amount for empowerment. Employees are trusted to do what is right by the customer. Are your ducklings free to venture out and do what they feel is right by customers? Or do you impose strict rules to keep them caged in? Consider letting your ducklings set sail. Trust that when they do what’s right by the customer, they’ve done what’s right by the company. When you set your ducklings free, you’ll find that customer satisfaction increases, the customer experience improves, and employees’ job autonomy shoots through the roof. Set your ducklings free! Next Next post: The Issue Is Not the Issue. How the Issue Is Handled Becomes the Issue.